6. Health clinic/abortion clinic—Health gives the impression that health is being restored to an individual. Similarly, clinic normally denotes a respectable, morally legitimate health care facility. Abortion is murder, not health care, so we should not dignify it with such dignified terms. Replace such terms with “abortion business,” “abortion mill,” “abortion facility,” “abortion center” and so forth. In the book The Herald of Fatima: John Haffert, which was recently reviewed by me, there is a chapter on the smoke of Satan infiltrating the Catholic Church to paraphrase Pope Paul VI. One such evil has to do with Freemasonry. The following is in reference to John Haffert's book which he wrote in order to stress the urgent message of Fatima. The book referred to by author Edna McGrew was "To Shake the World". ...Fortunately, matters did not end there The Congregation of the doctrine of the Faith immediately issued a condemnation of Masonry. However...according to Cardinal Gagnon: 'some prelates still make regular visits to the Vatican today...to convince the hierarchy that collaboration with Masonry is possible'. It should be clear to everyone that it is a very grievous sin for a Catholic to be a mason. Freemasonry, contrary to public perception, is a secret society rather than a fraternity. Its principles are fundamentally contrary to the Catholic faith and explicitly deny key tenets of Christianity. Below are ten reasons why Catholics cannot be Masons or participate in their activities. 1). The Holy See on Nov. 26, 1983, at the direction of the Pope, issued a "Declaration on Masonic Associations" restating the Church's position condemning the basic principles of Freemasonry. It also states that Catholics who join Masonic organizations are in a state of grave sin and are automatically denied Holy Communion. 2). God as described in Masonic works is an impersonal "Great Architect of the Universeî," not the personal God of the Patriarchs, the One True God of Revelation, the Father, the Son and Holy Spirit. 3). Masonic writings specifically deny that God has revealed Himself and His truths to us, or that He ever established a Church. 4). In Masonry Jesus Christ is portrayed as merely a man, a great teacher, on a par with Buddha or Mohammed and His Divinity is denied. 5). The Trinity is denied and compared to the "trinitiesî"of pagan religions. The Holy Spirit is blasphemed by Masonry's denial of the Divine Inspiration of Scripture. 6). Christianity is considered a derivative of ancient pagan religions and like all religions deliberately ladens itself with error. God is portrayed as a deceiver who leads many men away from truth as not all are worthy of it. 7). All truth is relative according to Masonry, thereby rejecting objective, absolute truth and therefore the dogmas of the Catholic faith. 8). Freemasonry is portrayed as the foundation of all religion and it is built on Naturalism, a system of belief that makes human nature and human reason supreme in all things. 9). At the various degrees when an oath is sworn, even the initial ones, it is a blood oath swearing for example, "binding myself by no less penalty than that of having my throat cut from ear to ear, my tongue torn out by its roots, and buried in the sands of the sea..." This is a real oath sworn with one's hand on the Bible or Torah, etc. 10). One can easily be deceived by Masonry's rituals and symbols that an objective transformation of man is being carried out. This will lead one away from the workings of God's grace especially manifested in the Sacraments instituted by Christ. Remember, Masonry denies Christís Divinity and therefore His role as our Savior. For further information the book "Freemasonry: Mankind's Hidden Enemy"can be obtained from TAN BOOKS, Rockford,IL., ($8.00 retail). Your local bookstore can order it for you. Let us remember St. Maria Goretti, who, to go to Sunday Mass traveled on foot -- a journey of 15 miles from home (to and fro). We should think of Santina Campana, who went to Mass while she had a high fever. 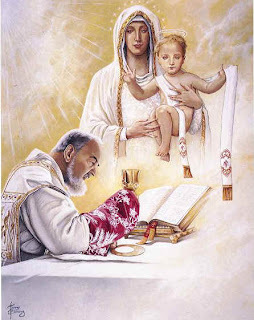 Think of St. Maximilian M. Kolbe, who offered Holy Mass when his health was in such a pitiful condition that one of his brothers in religion had to support him at the altar so that he would not fall. And how many times Padre Pio of Pietrelcina celebrated Holy Mass while he was bleeding and had a fever! When illnesses sometimes prevented the saints form taking part in Holy Mass, they united themselves at least spiritually to the priests who were celebrating Masses in all the churches of the world. This was what St. Bernadette, for example, did when she had to be confined to her bed for a long time. 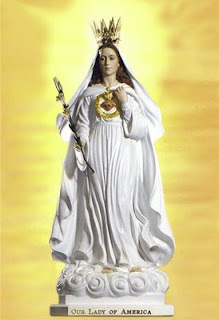 She would say to her fellow sisters: "Masses are being celebrated in different parts of the world every hour. I unite myself to all these Masses, especially during those night when I cannot sleep. In our down daily lives, we ought to rank the Holy Mass ahead of any other good; for, as St. Bernard says, "one merits more by devoutly assisting at a Holy Mass than by distributing all of his goods to the poor and traveling all over the world on pilgrimage." And it cannot be otherwise, because nothing in the world can have the infinite value of one Holy Mass. "Martyrdom is nothing," the holy Curé D' Ars said, "in comparison with the Mass, because martyrdom is the sacrifice of man to God, whereas the Mass is the Sacrifice of God for Man!" All the more we ought to prefer Holy Mass to mere amusements that waste our time and bring no profit to our soul. St. Louis IX, King of France, attended several Masses every day. A minister of the government complained, remarking that he could better devote that time to the affairs of the kingdom. The holy king replied, "If I spent twice that time in amusements, like hunting, no one would have any objection." Let us be generous and willingly make sacrifices so as not to lose so great a good. St. Augustine said to his Christians, "Every step one takes while traveling to hear Holy Mass is counted by an angel. One will be given a high reward for them by God in this life and in eternity." The Curé D' Ars adds, "How happy is that guardian angel who accompanies a soul to Holy Mass." DON'T MISS THIS CONCERT...TAKE YOUR KIDS! The excitement is building...a totally unprecedented event is coming together in Honolulu called...Stand for Life! Dozens of pro-life charities, churches, musical artists, and individuals are joining their efforts to present a Christian concert under the stars at Kaka'ako Waterfront Park Amphitheater on Saturday, November 14 from 5:00-9:00pm. Stand for Life will serve as a benefit for local pro-life ministry and will provide an opportunity for attendees to hear about life issues from a Christian perspective. Hawaii Right to Life Education Fund is one of the beneficiaries of the event, along with Hawaii Family Forum, HOPE INC, Aloha Pregnancy Centers, Pearson Foundation, and others (for a complete list, see Stand for Life Hawaii). The concert will feature nationally recognized musical guest The Kry, along with local talent Native Roots, Remember Him, Holyjam and the California-based Driven Cure. Tickets are available now for a suggested donation of only $10 ($12 at the gate, keiki 12 and under free). To purchase, make your check or money order payable to Hawaii Right to Life and write "Stand for Life" in the memo line. Mail your payment to 81 S Hotel St, Ste 200B , Honolulu , HI 96813-3144 by Wednesday, Nov. 11. Tickets may also be purchased by credit card by calling the Hawaii Right to Life office at 585.8205. We welcome additional gifts beyond the ticket price, which will help us underwrite the cost of the event and which are are tax deductible. Without a strict observance of the fundamental Code of Honor [cf., that a gentleman does not lie, cheat, steal, nor tolerate those who do], no man, no matter how ‘polished’, can be considered a gentleman. The honor of a gentleman demands the inviolability of his word, and the incorruptibility of his principles. He is the descendant of the knight, the crusader; he is the defender of the defenseless and the champion of justice… or he is not a Gentleman. …Does not discuss his family affairs in public or with acquaintances. …Does not speak more than casually about his girlfriend. …Does not go to a lady’s house if he is affected by alcohol. He is temperate in the use of alcohol. A persecuted priest in the then Soviet-occupied Lithuania, Archbishop Sigitas Tamkevicius says it was his daily, secret celebration of the Eucharist in his prison cell, as well as his love for God and compassion for others, that helped him survive and grow stronger in his faith. Thanks Cathy for the tag. As the title says, I have to say something nice about a priest. It is hard to narrow down my choice to one priest. It is also hard because ever since the Maryknoll Fathers have left the islands, my family hasn't really developed a close, personal relationship with any priest....you know...having him come over for dinner, etc. I am going to choose Fr. Patrick. He is a big, Irish priest who looks younger than his actual age of late 50's. Some would find him curt at times. Maybe some find him to be abrasive and insensitive to their feeling. He runs a tight ship at his parish. He is a no-nonsense type of priest. Yet, he is a good priest. He has a great devotion to the Holy Eucharist. He is keenly aware of his failings and he talks about it openly. He is there when a lonely person has no one to advocate for them with hospital officials. He has almost single-handedly resurrected a dying parish. 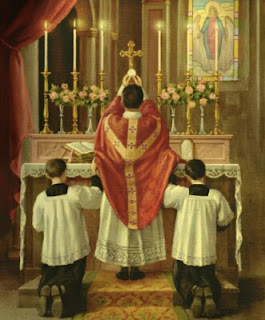 He has brought back reverence to the Holy Mass. He surrounds himself with other holy priests and brothers...and sisters. He expects nothing but the best for God and his church. He is a real priest, with real failings and a wonderful sense of humor. And he is a good role model who continuously challenges and inspires the young. He is the pastor of my mother's home parish and I am blessed to be able to be a part of his parish when I go home. O merciful God, we cry to Thee for pardon and for mercy. We are an unbelieving and perverse generation. We are disobedient, disloyal and ungrateful to Thee. We have excluded Thee from our homes, our schools, our places of business. We are no longer worthy to be called Thy children. Save us from the scourge we deserve. Teach us Thy law, and move our wills to serve Thee today and everyday. 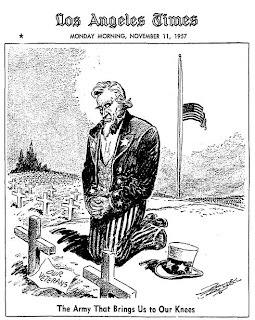 Merciful God, please spare America! 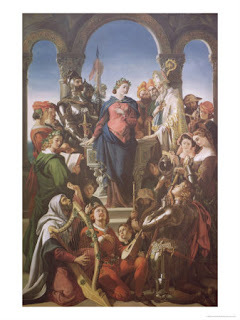 At the recent Marian Conference my friend Lois showed me a print out of an article I am sharing with you here. At the exact moment I was reading the article, my friend Dottie approached me and showed me a prayer card of Our Lady of America! We were all struck in awe of that God-incidence! * Why Libya's Qaddafi is probably correct when he says that "there are signs that Allah will grant Islam victory in Europe without swords, without guns, without conquests"
* Dangerous consequences that are likely to come from manifestations of "cultural sensitivity" -- such as the fact that U.S. guards at Gitmo must handle copies of the Koran only when wearing gloves because the detainees regard infidels as "unclean"
A big mahalo to Lois for making sure that I read this important message from our Lady. 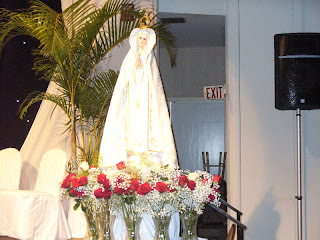 My mother and I, along with many other Catholics attended the 2nd Annual Marian Conference sponsored by the Our Lady of Peace Prayer Group Hawaii. Both were very long days but worth every second spent there. We got to hear really good talks by Bishop Larry Silva on Our Lady of Guadalupe, Father Vince Inghilterra, spiritual director of the group, on combating evil with the most powerful weapon, the Holy Rosary, Fr. Mieczylslaw Piotrowski, SChr. (Fr. 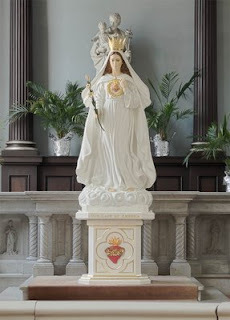 Mitch) on the secrets of Fatima, John Paul II, the evils (specifically that of abortion) that assail the world because we do not heed our Lady's warnings, and Fr. 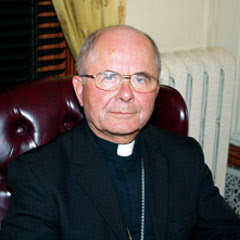 Andrzej Trojanowski (Fr. Andrew) also a Society of Christ priest, who spoke about their magazine Love One Another. It is now translated from Polish to English. I cannot recommend this Catholic magazine enough. Those of you who are local and would like a magazine, let me know and I will give it to you next time I see you. Sister CC, OSB was the emcee and also a speaker. She share her story of coming home and her vocation. She attended two canonizations this year! Another guest speaker was Wayne Weible, who has written books on Medjugorje. He apparently is an expert on the apparitions in Medjugorje. At the conference he addressed the controversy surrounding the apparitions, the visionaries and the Bishop of Mostar.